Thanks to Lorna, Chrystena, and Erin @ three sixty ecotique for this sweet write-up! Thanks to my groovy, fashionista business owner friends, I've been featured in in three sixty ecotique's blog! Here is the article: Click Here. If you haven't shopped at threesixtyecotique, you are doing yourself a disservice. Go check them out - they just expanded! About 6 months ago, I moved from Portland, OR back to Chico, CA. Now I'm moving to Durham - the small town I lived in before moving to Portland. My life is cyclical at the moment; with the current of a whirlpool - the energy of a twister. It will be a smaller place. I won't be able to have house shows with an open invitation, but I will be taking appointments to come by and see what I'm working on, with small groups. It's a new dimension, a new environment, and I'm real excited about it. I'm living on the grounds of Gale Vineyards. You heard me. A VINEYARD. I'll keep you informed,and pictures to come within the next month. 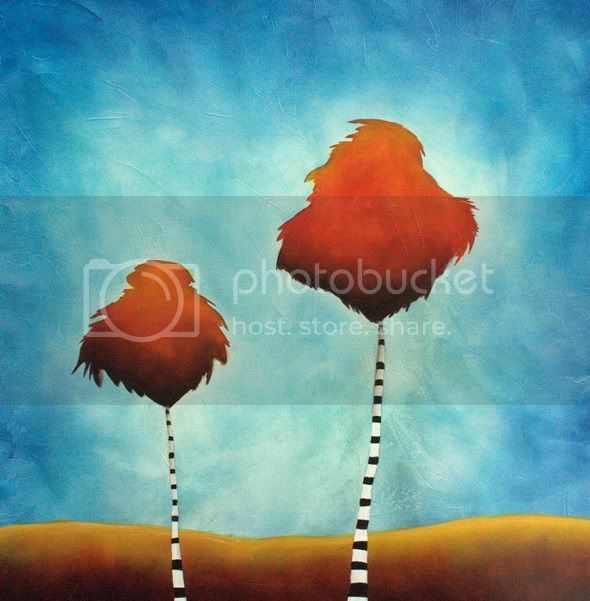 Trees, The Lorax, My Childhood and Art. As the first time, I'll bet. but the book is better. Read it cover to cover. My version of the truffula tree. The title of this one is "Unless." I sold it to new parents to put in their child's room. I hope that every kid can grow up with this story.